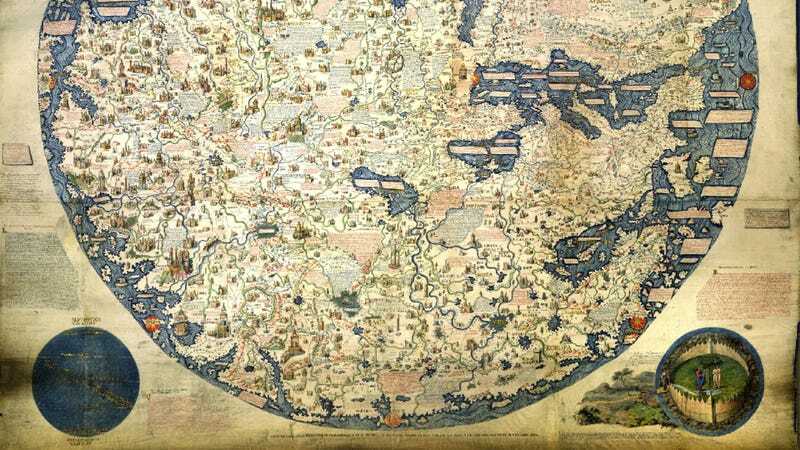 In 1450, Venetian monk Fra Mauro created what cartography experts say may be the first known "modern" world map. Two hundred fifty years later, a copy was made that now resides in the cartographic collection of the British Library. But this map is interesting for reasons beyond its age. As Brain Pickings' Maria Popova notes, this global depiction was created during the golden age of display maps, "the period between 1450 and 1800, when maps were as much a practical tool for navigation as they were works of art and affirmations of cultural hegemony or social status." [The Fra Mauro World Map] points south because 15th-century compasses were south-pointing. It shows the Portuguese discoveries in Africa and questioned the authority of medieval and classical sources. Intended for display in Venice, it emphasizes the feats of Marco Polo. The British East India Company commissioned this copy, thus implying that Britain was heir to the Portuguese empire.